There was not much fencing in Hong Kong before the Second World War, but some Hong Kong fencers did well in Europe. H.S. Mak, our former President, fenced for Oxford University and Oswald Chan, a member of another prominent Hong Kong family, was a Cambridge Blue and a popular figure in British fencing. It really all began when J. de. C. Marcal, the Ozorio brothers and other Portugese from Hong Kong spending the War Years in Macau, started a fencing circle instructed by Fausto Branco, a Portugese Olympic fencer. In spite of an acute shortage of equipment, a remarkably high standard was reached. This band of pioneer returned to Hong Kong to form a nucleus which was to grow into the Hong Kong Amateur Fencing Association founded in 1949, and later affiliated to the International Fencing Federation and the British Empire Fencing Federation (now the Commonwealth Fencing Federation). At first, there were few Chinese fencers and competitions were dominated by members of the Services. More and more local people were taking up the sport and they showed a remarkable talent for it. Fencing was at its peak in 1957. Under the leadership of Mr Peter G. Williams, the Association was able to function more effectively and efficiently. The growing popularity of the sport enabled us to send a team to the Empire Games (now called Commonwealth Games) in Wales in 1958. The Team consisted of J. Marcal, P. Marcal, Peter Lee, Reuben Lynn and Hung Hak Yau. Hung became a finalist in the individual foil event. In 1958, Mr P.G. Williams left for Japan on business and fencing came into a lull; even though the sport of fencing continued to grow steadily, no significant achievements were made for the ensuing years until he returned and became the President of the Association in 1964. Fencing activities once again flared and a team of three fencers were sent to Manila. This team consisting of Hung Hak To, Robert Elliott and Denis Cunningham did extremely well and won the tournament capturing all the three team trophies and most of the individual titles. In 1970, a triangular meet was arranged in Hong Kong with the Philippines and Taiwan again with tremendous success. 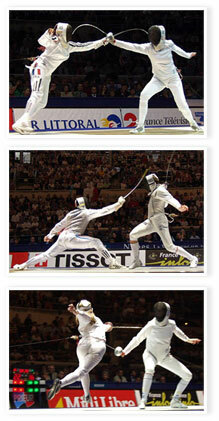 From then on, Hong Kong has been very active in the international fencing scene. Numerous exchanges were made with the South-East Asian fencing countries and representations were made at most of the major international tournaments like the Commonwealth Games, the Asian Games, the Olympic Games, the World Youth Fencing Championships, the Oceanic Zone Championships etc. The two local fencing stars born in the late sixties, Mr Denis Cunningham (now the Chairman of the Association) and Mr Matthew Chan, dominated the Hong Kong fencing scene. They have led Hong Kong into many victories and have consequently gained recognition in Asia. They too have placed Hong Kong on the map of world fencing. Matthew Chan came sixth in the epee event in the 1974 Asian Games in Tehran and fourth in the foil event in the 1978 Asian Games in Bangkok. With these two in the team, Hong Kong was also placed fifth and sixth in the sabre and foil team events respectively in Tehran and fourth and sixth in the foil and epee team events in Bangkok. It was very unfortunate that Denis Cunningham was injured on the fencing piste during the individual foil event in Bangkok, or Hong Kong could have had a very good chance of taking a bronze medal in either the team foil or epee at the 1978 Asian Games.